An important part of running a successful business in Minnesota is having a solid legal foundation. When you need help choosing a business entity, Roulet Law has the experience to assist you. Don't let one lawsuit cripple your business. Contact Minnetonka asset protection attorney Chuck Roulet to learn about your options. You may have a new or growing family, or maybe you're taking steps toward starting a small business in the Minnetonka / Maple Grove area. Perhaps you are retired and finally have the free time you've been waiting for. It's an exciting time, but there are probably a lot of "what if's" running through your mind. "If something ever happened to me, would my kids be in good hands with enough money to live comfortably?" "Is a will the best option? I keep hearing about trusts. What are the differences and which one would be better for my family and me?" "Are there ways I can set up my company so I don't pay any more taxes than I have to?" "How can I best protect my home, my retirement, and my other assets?" Roulet Law Firm will help you protect what matters most to you by putting plans in place that will protect your family, your assets, and your business. We take the time to answer each and every one of your questions so you can rest easy knowing that the plan we put in place will help you accomplish your unique needs and goals, whether that's starting a new business or helping ensure that your children would always be raised by the person you want, how you want, and ensure that the money you leave for those you love would be protected. 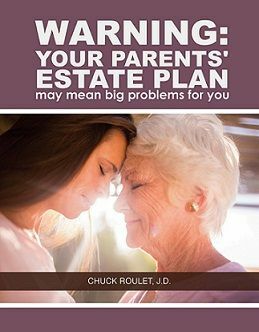 Attorney Chuck Roulet has also published a book about estate planning for parents with minor children, so even if you are not a Minnesota resident, you are still able to tap in to his experience by reading What Happens To Them: What Every Parent Should Know About Estate Planning. Chuck Roulet's team isn't just here for what's happening now in your life—we are here for what could happen in the future. If you fail to plan, you plan to fail, so let us help you protect what matters most to you. We provide high-quality, personalized service in a cost-effective manner. If you are interested in learning more about estate planning, we offer a complimentary, no obligation initial consultation. 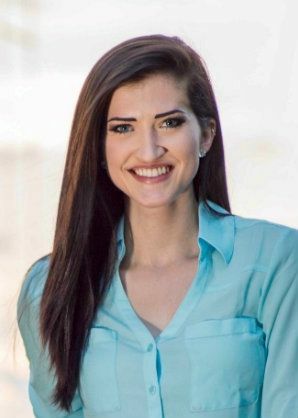 Our free initial consultations enable us to get to know you, identify your goals, evaluate your options, and determine an appropriate course of action to meet your unique needs. We are licensed to serve all of Minnesota including the Minneapolis suburban communities of Minnetonka, Maple Grove, Plymouth, Wayzata, Eden Prairie, Edina, Champlin, Brooklyn Park, Rogers, St. Louis Park and all other communities throughout the Twin Cities metro area. Call us toll free today at (888) 719-5589 or simply fill out our online contact form and we will be in touch with you! Our free reports can help you better understand your situation and help you make the right decisions. These books are FREE for Minnesota residents. Download your copy today! You may be surprised to learn that in an emergency, your kids could end up in the care of someone that you would not have chosen. 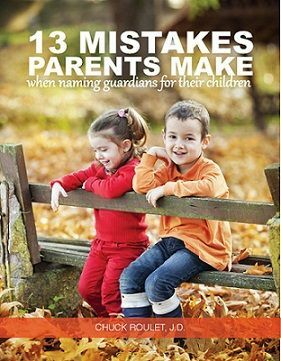 In my free book, you'll learn the steps you can take to legally protect your children and the money you leave for them. Download your copy today! Your parents will and/or trust is most likely seriously outdated and may not work when you need it. Learn the pitfalls and how to avoid them. 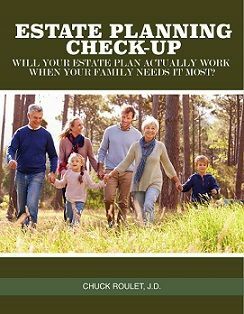 Estate Planning Check-Up: Will Your Estate Plan Actually Work When Your Family Needs it Most? Even if you have an estate plan in place already, recent changes in the law may mean that you and your family are not as protected as you think. Download this report, take the simple quiz and you'll quickly (and easily) know if your estate plan is up-to-date. Roulet Law is not your typical law firm. 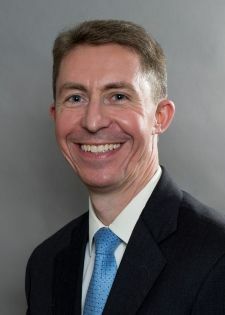 Attorney Chuck Roulet graduated first in his class in the area of Estates and Trusts and did the big law firm thing, working in Washington, DC, and Minneapolis. He noticed that many law firms were not adequately serving the needs of families and small businesses. 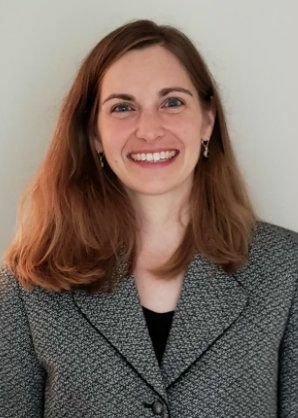 The deficiencies he saw in the law firm plans were leaving clients and their children at risk: making it more complicated and expensive to pass on their inheritance, risking that their children would receive their inheritance unprotected, exposing them to the possibility that their children could be raised by people they never intended, and leaving them without the authority to make critical medical decisions (Link to Warning Report) for loved ones. He saw how giving more careful attention to each client's business plans could help save taxes and offer better protection. Chuck went on to establish his own law firm, creating an environment where he could incorporate his detailed knowledge of estate planning, asset protection, and Minnesota business law to create estate plans that better protected his clients and their families, and business solutions that better suited the needs of small businesses. When you work with Chuck at Roulet Law, you won't have to worry about the meter running while you make life-changing decisions. Chuck wants to be sure that your plans address your unique needs and goals and he doesn't want you to have to worry about hourly rates. You'll know what things cost from the very beginning with flat-fee, value-based billing, and he sets out several options so his clients can select the plan and fee that is right for them.